WELCOME to the 23nd issue of BYMRr-Zine - a newsletter published by Building Your Model Railroad, devoted to providing breaking news and tips to model railroaders of all ages and all scales in a quick and easy-to-read format. Resources are always credited where appropriate. 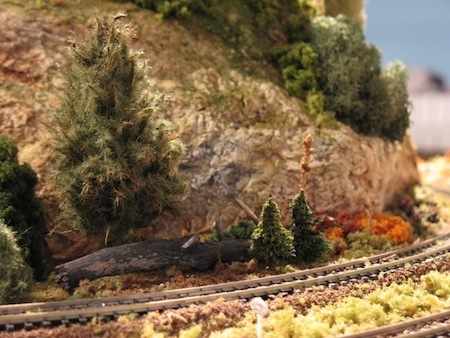 Send in Your Tips/Comments/Suggestions: Let me know if you have any tips to pass on to other model railroaders. Just type them in on the Comments Page of the website or send me an email directly to gregwarth@building-your-model-railroad.com. In addition, if there is a particular topic you would like to see appear in the newsletter, let me know about that as well. Christmas and trains have always gone together, like Mom and apple pie. Most of us were first introduced to model trains on Christmas Day. I can still remember my excitement at age six when Santa presented me with my own American Flyer steam train on an oval track around the tree on Christmas morning. That has to be one of the highlights of my life - as it has been for many of us. And here I am now 58 years later, still marveling at how the models of those behemoth machines move around on 2 rails carrying a line of cars destined for parts unknown. The mystery, the wonder and awe are still there after all these years. 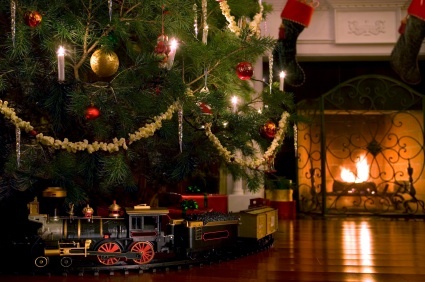 We wish you and yours a very merry train-filled Christmas! And may the mystery, wonder and awe of it all be with you forever. 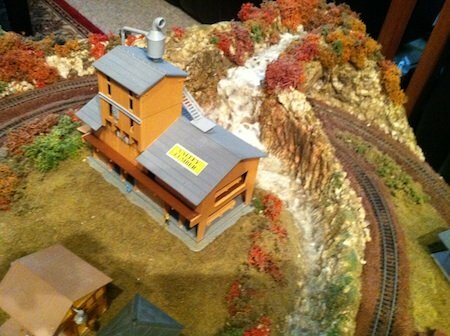 For the ultimate in realism, you need to be sure you have enough trash laying around on your layout. Just look around the streets where you live, the urban areas, the farms, the railroad yards, along highways, behind industrial buildings and construction sites. There's always trash laying around - sometimes in piles, but sometimes just scattered around the area..
After you finish building a model, there are usually a few plastic pieces, bits of styrene or wood, paper, dried glue and paint laying on your workspace. Scrape that debris up and save it for when you need to add litter or junk to a space on your layout - maybe even a pile of it behind the building you just finished. Ref: "Make Your Own Trash", by Tracy McKibben, NMRA Magazine, Dec., 2012, p32. In our never-ending search for the ideal method of track-cleaning, two new things came up in my reading recently. The first is the "Dust Monkeys" made by Noch originally, now also sold by Woodland Scenics. You just purchase these little pads, which are attached to pieces of plastic that can be installed on the bottom of the wheel trucks on freight cars. You can even put one on each truck of the same car so you get a push and pull effect as the car travels over the rails sweeping up litter, dust and whatever else that collects on tracks. The second easy and inexpensive method is to cut out a small square or rectangular piece of masonite that is a little wider than tracks, then insert 2 one inch nails through the masonite. Then drill 2 holes in the bottom of your freight car the same distance apart as the nails in the masonite. The drilled holes have to be big enough that the nails will slide though them easily. Now you can pull your freight car around the track with the small masonite board underneath it cleaning the junk off the rails. For extra cleaning power, glue a piece of fine sandpaper on the bottom of the masonite board. You could make several of these boards - one with sandpaper on the bottom, one with corduroy padding, one with an eraser glued on, etc. Soon you will have a whole fleet of cleaning cars, that can be employed on a regular basis to keep those tracks in the best condition possible. Ref: "Track Cleaning Car Round Up - Part 2", by Ron Bearden, N-Scale Magazine, pp.24-29. It's always fun to add some festivity to your scenes by adding some christmas figures like Santa, elves, carolers, sleighs, a little snow- or ice-covered scene, an ice-skating rink, wreaths (made from green pipe cleaners) on houses or even on the front of your locomotives. Some of these items can be purchased in the form of tree ornaments that you can modify for your layout. Add some tiny LED lights to one or more of your evergreen trees. Make a ski slope, complete with cable cars. Create a manger scene. Cut out silhouettes of figures like the three kings on camels and put a light behind the silhouettes to enhance the effect. Place a Menorah on the inside of a window. Put tiny LED lights, or just use some reflective glitter on the bushes next to houses to show how communities have decorated their homes for the Holidays. Use small spotlights to "light up" the glitter. This is a great time of year to share your hobby with friends and neighbors, kids and grandkids, other family members visiting for the Holidays. Amaze them with your layout. Make sure everything is working well before they arrive so you don't have to spend time troubleshooting. Get some of the kids to work on putting models together. Get the older "kids" involved in the electronics, or maybe even the benchwork, depending on what stage of building your layout you are in. Some of them will be excited to help and will enjoy doing something unusual, rather than just sitting around watching TV. You may even recruit some of them to be permanent members of future building or operating sessions. Or you may inspire one or more to build their own model railroads when they go back to their homes. 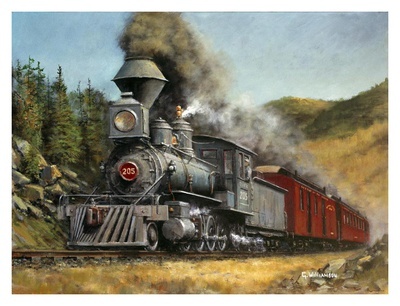 ~ There are lots of train shows and exhibits going on right now. Be sure to visit one or more of them. Some of the botanical gardens and train museums make fantastic Christmas displays. ~ Paint a backdrop suggesting mountains and a treeline by using painter's tape as a stencil to outline the shape of the mountains, then airbrush inside the area with black, olive green , tan or gray paint, depending on the effect you prefer. Remove the tape and soften the edges by dusting the tops of the mountains with the airbrush using the same paint. This fuzzy top suggests a distant treeline. ~ For subroadbed under your roadbed and track, use 4mm thick asphalt-based sound-deadening mats that are used in automobiles to deaden sounds and vibrations. They are available in automotive stores and are made by Design Engineering, Inc. and Dynamat. ~ Create a winter scene either on or off your usual layout by using the techniques described in the BYMRR website - Modeling a Winter Scene. I made a small winter diorama one year and brought it to work for a winter train display in my office. ~ Make stone walls by first cutting out a piece of cardboard to the size you want your wall to be. ( You can do this for arched stone bridges as well.) Then glue small stones to the cardboard. Use fine portland cement to fill in the areas between the stones to serve as mortar. ~ Add mortar lines to your brick buildings by using diluted 1:1 flat white latex paint. Brush it on the walls. Wait a minute and then wipe the walls in a downward motion with a paper towel. 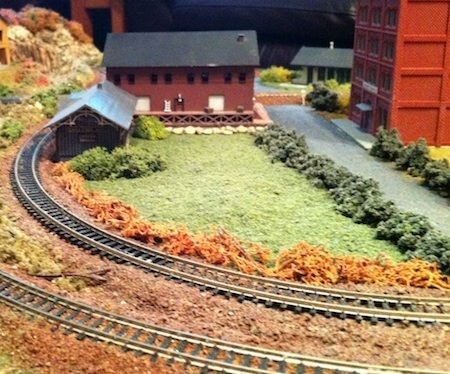 This section is used to focus attention on outstanding model railroading websites or layouts. This month's spotlight is on Jay Matz' 1930's era HO Douglassville Locomotive Works (DLW) - 20 years in the making, built by Jay and friends and located in Douglassville, PA. This layout is truly awesome and inspiring. The You Tube video is located at http://www.youtube.com/watch?v=z_HSEY1OjBQ. The link to the website is http://www.dlw-model-rr.com/index.html. Put a Poster in Your Train Room!